Why would a magician want to be a MC Master of Ceremonies? What special skills does a magician have that pre dispose them to standing on stage as a host or compere of an event? According to experienced MC Timothy Hyde they have already have a skill that gives them a head start that many others will never access: the ability to control a crowd. Timothy Hyde has worked in this market for over 20 years. It now makes up the majority of his work. He’s been paid to travel all over the world to run events, including assignments in – Hawaii, New Zealand, Hong Kong, South Africa, Cambodia and of course every possible city in his home country Australia. For the last 10 years he has also been mentoring and coaching other entertainers who want to break into this lucrative field. Just what is an MC MC, Emcee, Master of Ceremony, Host or Compere and what do they do? How the job of being an MC relates to the world of magic and the experience magicians have. Learn the typical events an emcee would be booked for. Learn how Timothy Hyde progressed through drama studies, street performing, theme parks, stage illusion shows and mentalism to work an Master of ceremonies and why this rich experience helps in the emcee role. Find out the positive aspects he brought from the world of magic into the role of MC? How does being an MC stack up against being a corporate magician / mentalist in general terms? What is the #1 quality you should look for within yourself if you are thinking being an MC? What are the misconceptions about the role of an MC? 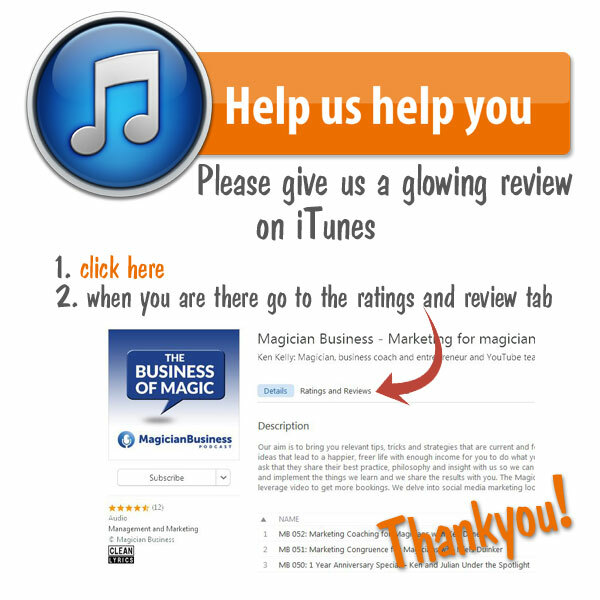 Can magic be incorporated into MC work? Is this a good or bad idea? Who the people are you need to work with at events and how to deal with them to make the whole experience better. What itis that the people booking you want? The things you can do as MC to value add to their event and make yourself more book-able. 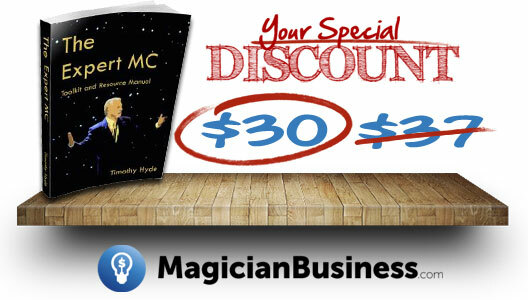 Get your Magician Business discounted copy of Timothy Hyde – MagicCoach Expert MC. And as a bonus for listening and learning and taking action by coming to this page Timothy has made these reports available to you.